Several EBJI Members attended the 2011 Capital Open, held October 9, 2011 in Sacramento, CA. Representing the dojo were Cole Filson, Josh Laba, Takashi Matsumoto, Jason Wood, Nick Wood, Masashi Matsumoto, Satoshi Matsumoto, Nico Gonzalez and Estefany Gonzalez. Leading the way for EBJI was Cole Filson and Nico Gonzalez who both won gold in their respective divisions. Cole, who is a 7 year old yellow belt, had a fantastic day winning all 4 of his matches by ippon (full point). He had a particularly impressive second match with a tough opponent whom he threw with osotogari to win the match. Nico (13) also had an impressive day winning all of his three matches. 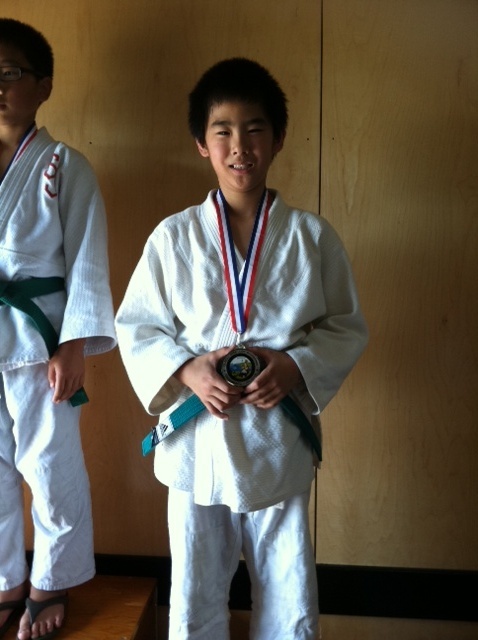 In his first match, he threw his opponent with osotogari for ippon. In his second, he scored a yuko (half point) and was able to hang on for the lead. For his third and final match he faced a challenging opponent. The match went into golden score (overtime) and Nico threw his opponent with sasae-tsurikomi-ashi for yuko to win the match. Estefany Gonzalez (15) and Masashi Matsumoto (12) each won silver medals in their divisions. Estefany showed vast improvement from her previous competitions as she aggressively gripped, threw and pinned her first opponent for ippon. In her second match she faced a familiar opponent and made several adjustments. However, she was caught for some minor scores and was unable to come back from behind. In her last match, she continued her aggressive gripping strategy. The girl made a weak attack and Estefany choked her opponent for ippon to win a silver medal. Masa also had a great day going 3-1 in his division. 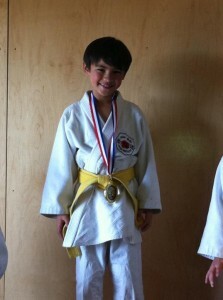 He threw his first opponent with uchimata for yuko and pinned him for ippon. In his second match, he lost a close battle against a formidable opponent. Masa threw his third opponent with kouchi-makikomi for ippon and in his last match threw his opponent for ippon again to win gold. Sato Matsumoto (12) and Nick Wood (12) evened out the medal count by each taking bronze medals in their respective divisions. They each won 2 matches and lost 2 matches. Josh Laba (8), Taka Matsumoto (9) and Jason Wood (10) all fought with great spirit and won some matches, but were not able to bring home any hardware. All the competitors were accompanied by Ken Sensei and Sayaka Sensei who coached them throughout the day. All EBJI members now turn their attention to the Albany Judo Tournament which will take place October 23, 2011 at Albany High School.